I love this black and white photograph. It came to me from Aunt Madeleine, my Mom’s elder sister. I don’t know how she acquired it, but it must have been in her family (or that of a maternal aunt) before she became its owner. The “1930” date isn’t correct. 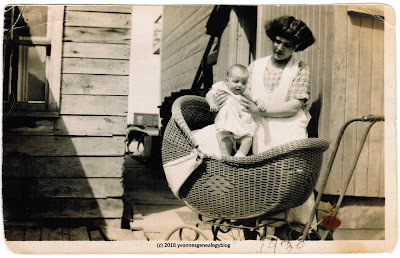 Mariette, born in December 1927, looks to be about 6 months old, so the year should be 1928. Also, it was probably July or August, based on the light clothing mother and baby are in. Juliette wears a short-sleeved, checkered-patterned cotton dress, over which she donned a generous apron. She has a fine head of bobbed hair. When I enlarged the photo, I noticed that she’s wearing a plain band ring on each hand. Baby Mariette, in a cloth diaper, wears a dress and little socks. I don’t know the photographer's identity. Was it Juliette’s husband Eugène, or perhaps her sister Marie Louise, who visited the young family that year? Or was it maybe a travelling photographer? Whoever took the photo, it was probably a spur-of-the-moment thing, because Juliette is dressed casually and wears an apron. The picture was likely taken in Hearst, where Mariette was born and where her father worked as chief of police. The small mat by the door of the house on the right suggests it’s someone’s home – Juliette and Eugène’s? I checked online images of baby carriages and found similar ones in the Eaton's Spring and Summer 1926 catalogue. * The 1926 models are described as Pullman Carriages and cost between $19.85 and $39.50. The body of Juliette’s baby carriage looks like wicker, but the Eaton’s ones are made of “fibre reed”. A wonderful and precious photo of my grandmother and aunt taken 90 years ago. * “Canadian Mail Order Catalogues”, database, Library and Archives Canada (http://www.bac-lac.gc.ca/eng/discover/postal-heritage-philately/canadian-mail-order-catalogues/Pages/canadian-mail-order-catalogues.aspx : accessed 1 July 2018), Postal Heritage and Philately, Eaton's Spring and Summer 1926, p. 388 (image 400).